These are the common emulator formats. Utilities such as PlayTZX and some emulators can write these out to tape, so you can then transfer the contents from tape to disk as described in the +3 manual (part 20). Alternatively, you can use John Elliott's excellent TAPROM utilities to extract files directly on your +3 or +3e. All of the software on this page is also available on a hard disk image. 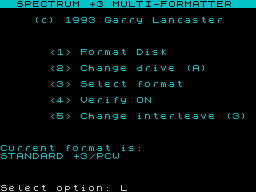 You can use this in a suitable emulator, and then (depending on your emulator) copy the files direct onto a compactflash card/hard disk for your Spectrum, or onto another HDF image which matches your drive - this can then be transferred to the real disk using an imaging utility. The Picturesque Code Machine Monitor/Debugger is an excellent debugger that runs on any Spectrum. I have developed a patch for v3.1 of the program which makes it run completely independently of any Spectrum ROM routines and character set etc. This means it is suitable for stepping through and breaking into code running in the ROM area, which is very handy for debugging ResiDOS applications and packages. The patch uses an extra 1526 bytes, which you should take into account when choosing the monitor address. Note: I have recently discovered that the Code Machine attempts to detect Interface 1 (for printer support) in a non-standard manner. It reads port $EF, and if the lower 4 bits differ from $F, it assumes that Interface 1 is present and starts calling hook codes. This will cause a hook code error on ResiDOS if hardware is present on port $EF, but no Interface 1 hook code-compatible package is installed. Particularly, ZXMMC+ users will be affected by this. To cure the error, issue a POKE (X+2530),24 command and then RANDOMIZE USR X will successfully start the debugger. (NB: This has already been done for the the pre-patched cm31.bas/cm31.c files below). The following files are a pre-patched version that loads and runs to address 40000. Simply copy these to your disk and LOAD %"cm31.bas". 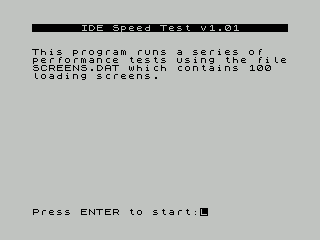 This program tests the data transfer speed of your hard disk system. Several tests are performed, using a data file containing 100 screen images. Transfer speeds are checked from the filesystem and swap partitions. Note that the results from the first run of this program may be unreliable on the +3e, and you should re-run it for accurate results. Also note that the transfer speeds are highly dependent upon the filesystem being used (the filesystem which is tested is the one to which you have copied the screens.dat test file). 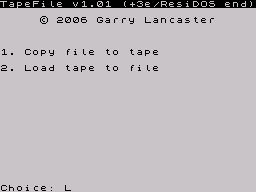 Currently, the FAT filesystem on ResiDOS is much slower than the IDEDOS filesystem (available on both +3e and ResiDOS). If you have a swap partition, transfer tests will be performed using this as well; this will give higher speeds than either of the filesystems. 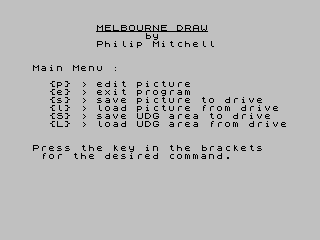 The classic drawing application, patched to save & load to a ResiDOS drive. Currently, the +3e is not compatible with the Multiface 3 (and similar snapshot devices such as the RamJet). This is because such devices have to assume that +3DOS may have been overwritten or corrupted by loading in a 128K game; therefore, they have to re-initialise +3DOS before attempting to access the disk. Unfortunately, the standard way to do this in +3DOS has the side effect of clearing the entire 128K memory, so the snapshot devices just copy their own data into place to "initialise" the system. This doesn't work on the +3e, as the data structures are different for hard disks. 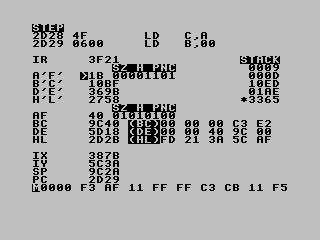 However, this program allows you to convert any snapshot taken by the Multiface 3 into a standard .Z80 snapshot (v3). This can then be loaded with the +3e's built-in SPECTRUM command (or copied to a PC for use with an emulator). Both 48K and 128K snapshots are supported. Note that a similar utility by John Elliott is also available, although this only currently handles 48K snapshots. This program will allow you to transfer files between +3DOS disks and standard 720K MSDOS disks using a simple file-selection and menu system. To use the program, you will need a 3.5-inch drive as your B: drive. Documentation is provided in the included msdos.doc text file. This program allows you to format disks in a variety of capacities, all the way up to 828K for double-sided 3.5" disks. It also gives you the option of creating CPC data-format and MSDOS compatible disks. Documentation is provided in the included mformat.doc text file. 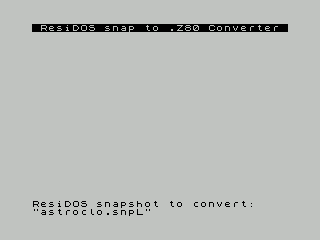 This utility converts snapshots created by earlier versions of ResiDOS (prior to v1.92) into standard .Z80 snapshots which can be loaded by the updated %SNAPLOAD command. Written by Bali, this excellent program allows you to copy tape-based programs directly onto your hard disk or compactflash card. The process is largely automatic, although you will need to modify BASIC loader programs after the transfer, so that they access the hard disk rather than cassette. This utility allows you to transfer files of any size between your PC/Mac and your Spectrum, using cassette tape for the transfer. It could also be used simply to backup programs from your drive onto cassette. To use the program, you will need an emulator which supports the Interface 1 and can re-direct RS232 input and output to files. Such emulators include EightyOne (for Windows), Z80 (for DOS/Windows) and Fuse (for Unix/Mac OS X; note that at the time of writing, this facility is only available if you're prepared to download and build the emulator from the latest CVS sources). To transfer a file between PC/Mac and tape, start the emulator and enable Interface 1 support. Then load the "tfe.tap" file in and follow the instructions. On your Spectrum, load the "tfr.tap" file in; this will install itself to your hard disk (thereafter you can just load the "tapefile.bas" program). This works in a similar way to the emulator side. These utilities (by John Elliott) allow +3 and +3e owners to manipulate the common emulator TAP file format. It's of most use to +3e owners for extracting files from the TAP files on this webpage. Then just LOAD "taprom.zeb" and the self-extraction program will automatically extract all the utilities and documentation. To use the software to extract files from TAPs on this site, LOAD "zxtract" and run the program once for every file contained in the TAP. 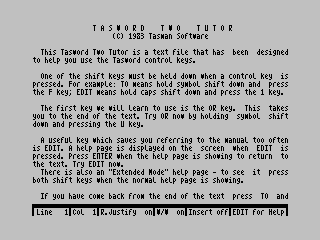 The classic word processor, patched to save & load to a ResiDOS drive. A short demonstration of the text windowing capabilities that are built ini to the +3e, and provided by the the Channels package for ResiDOS. 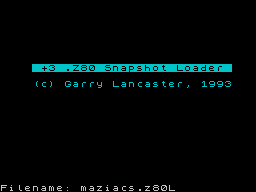 This program lets you load and run snapshots in the common .Z80 format on your +3 (+3e owners with hard disks or compactflash cards can now use the built-in SPECTRUM command). There are two versions of the program included; the standard Z80.BAS, and ROMZ80.BAS which loads a copy of the original 48K ROM so that games that won't normally run on a +3 (such as BombJack) can be played. Please note that both these programs only support 48K snapshots, and only those created using v1.45 of the Z80 emulator. Most snapshots on the internet are now in the later v2 and v3 formats; these will not work, however utilities are available to convert them back to the old v1.45 format. John Elliott's excellent ZXZVM, originally available for the +3/+3e and PCW series, has now also been ported to ResiDOS. 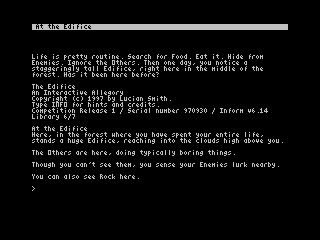 It enables you to play Infocom's superb interactive fiction games, as well as hundreds of modern games written over the last few years. This port allows you to choose your preferred colours and character set, as well as to send a transcript to your printer and save/load positions to disk. The installation program guides you through your options. Once installed, load it with LOAD %"resizvm.bas" (on ResiDOS) or LOAD "zxzvm.bas" (on +3/+3e). You can use TapeFile to transfer some suitable games from your PC/Mac. 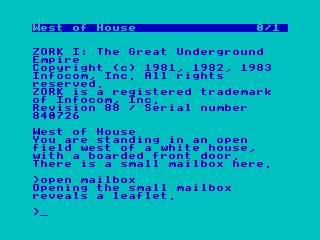 Hundreds of free games can be downloaded; the best place to start looking is at the Interactive Fiction Archive. ZXZVM can play games in the "zcode" format (sometimes known as z-machine, Inform or Infocom), and is capable of playing version 3, 4, 5, 7 and 8 games. This includes all the Infocom games except the last few graphical games (only a few of these can be downloaded free, however; Activision still sells compilation CDs of the rest).